Our little Boo has been home for three months this week. THREE MONTHS! It really has flown by, and in so many ways it still feels like he is brand new to us. I have been meaning to give an overall update on his progress for over two months now, forgive me. But hey, at least you get lots of information at once! I got awesome new glasses (that my parents may or may not have already “misplaced”) and a cool summer haircut. Watch out world! When we first got home, Boo couldn’t/wouldn’t drink except from a spoon. This made for a long feeding process, not to mention constant worry of dehydration. It took five full weeks for me to get little man to allow the bottle in his lips, but I felt like we’d won the lottery when it happened. We started with sugary sweet banana Pediasure to sweeten the deal, but now he is just a water man. We are moving away from the bottle and working on a variety of cups. 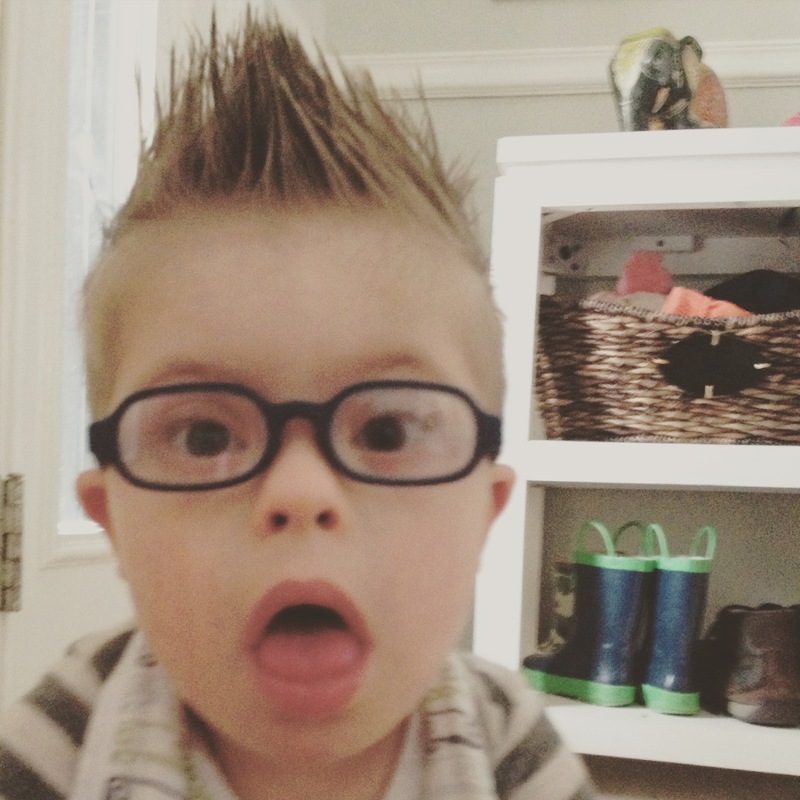 Long term, his speech/feeding therapist would love for him to drink from a straw, because that specific action strengthens his lip muscles and trains his tongue to tuck back into his mouth. But people, the baby drinks. It’s enough. I make a lot of funny faces while I eat! On the food front, he’s actually the best and healthiest eater of our bunch, including Daddy K and I. He will eat absolutely ANYTHING you put in front of him, as long as it’s the right consistency. We still blend most of his food, but I’ve been experimenting with leaving softer foods separate. I recently fed him scrambled eggs, watermelon and avocado all separate on a plate and he did great. The biggest issue with his feeding is that he still doesn’t chew. So, that means he won’t break down foods. If it’s too big, he will either spit it back out or choke. 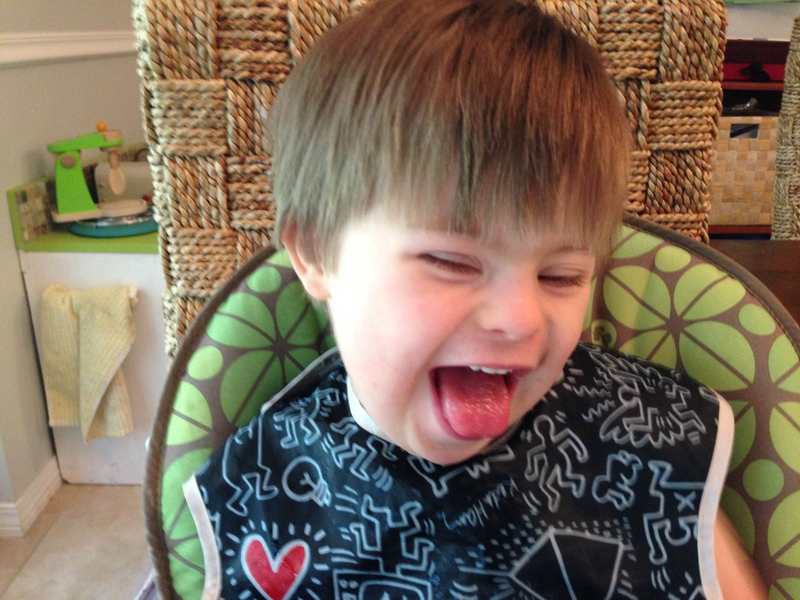 We are working on getting him to use his teeth, to teach him that he can control food input, move food around, etc. He basically uses a super strong suckle to get all of his food down. But he eats well, and we are getting into a routine making his food, so it’s not too bad. The boys became roommates like champs. They have slept in the same room at night and for naps since day one with no issues. 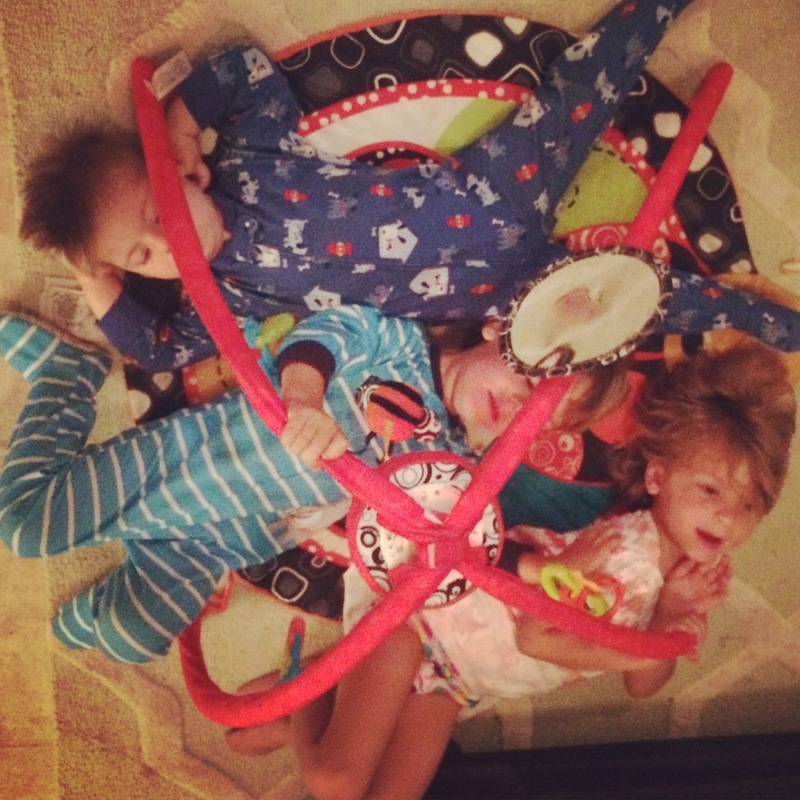 They still wake one another up from time to time, but for the most part it’s been seamless. Honestly, I don’t spend a lot of time checking the monitor for any of them anymore, so it’s possible Boo isn’t always sleeping. We move his crib away from the wall so he can’t bang his head, and if he’s rocking super hard we can hear it. But, he is at least resting for naps and through the night. Bug was sick recently, and crying so loud it woke Boo up. I was trying to rock Bug to soothe him, but he kept screaming anyway. Boo woke up, rocked violently and tried to lie back down. Since Bug was still wailing, it was no use. Boo got so frustrated that he started screaming too. 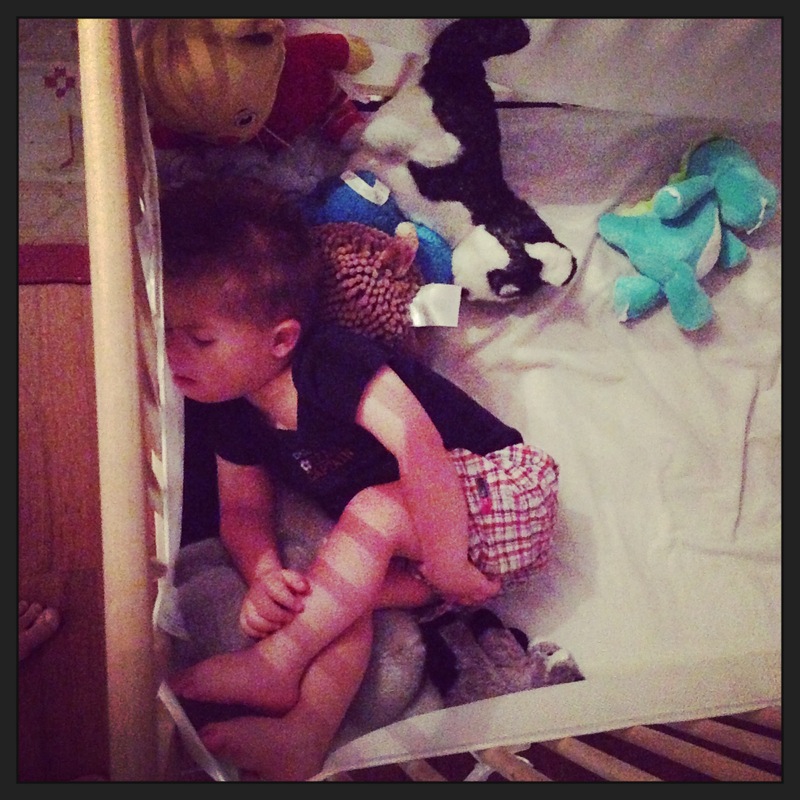 He honestly just doesn’t know how to deal with interruptions or how to put himself gently back to sleep. He was very displeased about being woken up at night, ha ha. I like to push up against all my stuffed animals. He still tends to fall asleep if he is overestimated at all. If we’ve been out for the day and he gets cranky, I just pop him into the carrier and he’s out within minutes. Sometimes it’s a great help, and sometimes it makes things tricky. His occupational therapy really wears him out and we usually go to the grocery store immediately after. The grocery store is like a sensory nightmare for him, and he’s asleep by the end of the first aisle. Unfortunately, when he catnaps early in the day he will often resist sleep for his nap. 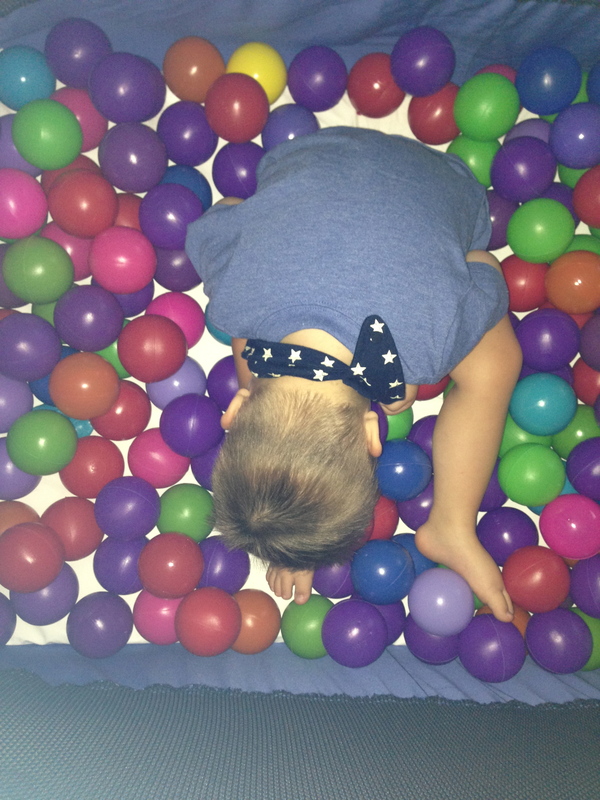 My mama thought I was working hard on sensory skills, but I was taking a little cat nap! Boo absolutely LOVES the water. Any water, any place, any time. Lucky for him, it’s water season, so we have spent a lot of time getting wet. At the beach or bay, he loves to sit and have the waves crash over his legs. The harder the waves hit him, the more he laughs. In both pools and the bath, he loves to put his hands on the bottom and then stare at them to figure out how they are actually separate from him. You can see his wheels turning as he tries to understand what water really is. 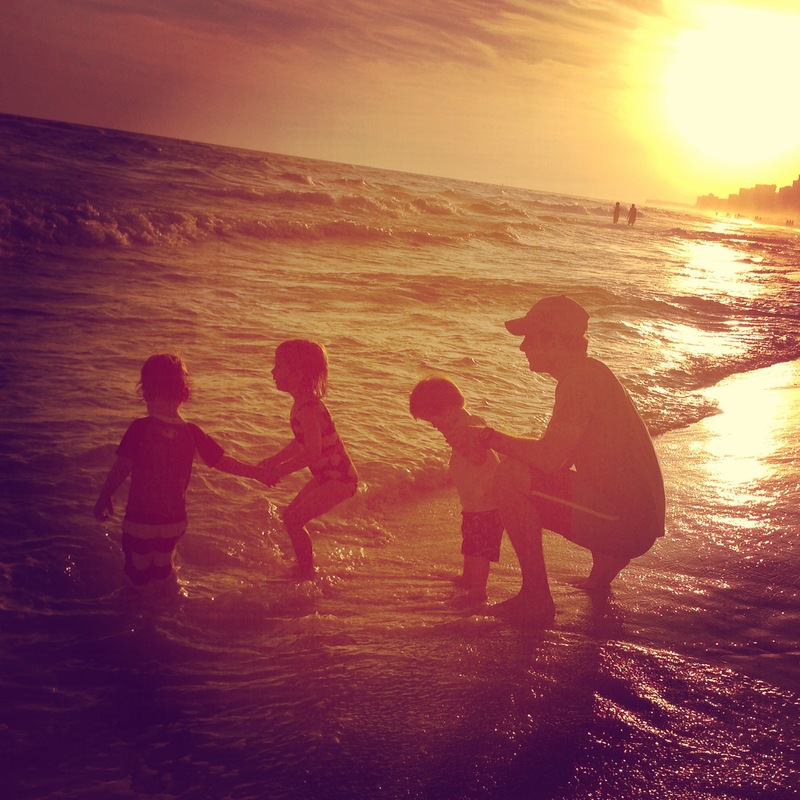 He also loves watching his sister and brother jump in and make a big splash. We are hoping he will be ready for swim lessons next year. Love getting wet in the sprinklers! The first “toy” he really gravitated to was an activity mat we pulled out. It has really been a progression. First he would just lie under it motionless (because we put him there), watching the lights. Then we noticed he would actually purposely maneuver himself under it. One day he started using his feet to knock it down, and then laugh as it popped back up. Recently, he has started grabbing at all of the hanging toys and trying to see how they are different. I actually even think he has been bored with it lately, and is ready for something new. But it has been neat to see him actually interested in playing with something. We have a vibrating teether from the others kids that we pulled out on a whim one day. Similar to the activity mat, it has been a slow progression. At first he wanted NOTHING to do with it and would turn or scoot away when I tried to show it to him. One day he let me vibrate it in his mouth (you have to apply pretty firm pressure to activate the vibration). Eventually, he used his own teeth to make the vibration happen, but when he was tired, he’d just let it fall out. Finally, he started being willing to USE HIS OWN HANDS (huge in this house!) to hold the teether in place. One day Daddy K noticed him picking up the teether, throwing it, and then climbing after it. He’d pick it up, throw it, repeat. Over and over. He “played” this game for 20–plus minutes. It was literally the first time we had seen him entertain himself. He now does this same game with a ball at one of his therapist offices, so we ordered him a light up, vibrating ball for his birthday. 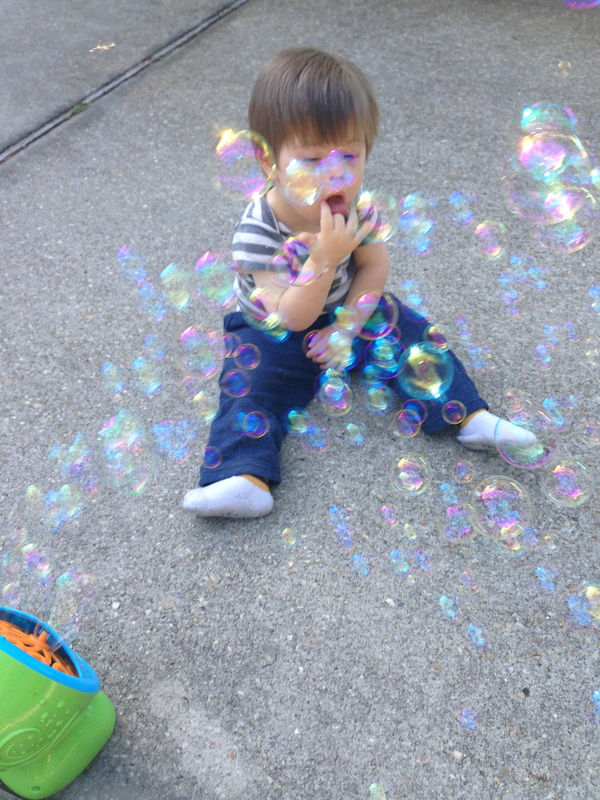 I’m also crazy about the bubble machine! But mama had to cut back my time, because I started trying to eat the machine every time! He is nuts about the iPhone or iPad, but I think it’s mostly just the light. He just wants to put his face against the screen and zone out. We would used this particular “dot” game on the IPad for a while when he was having a hard time relaxing. 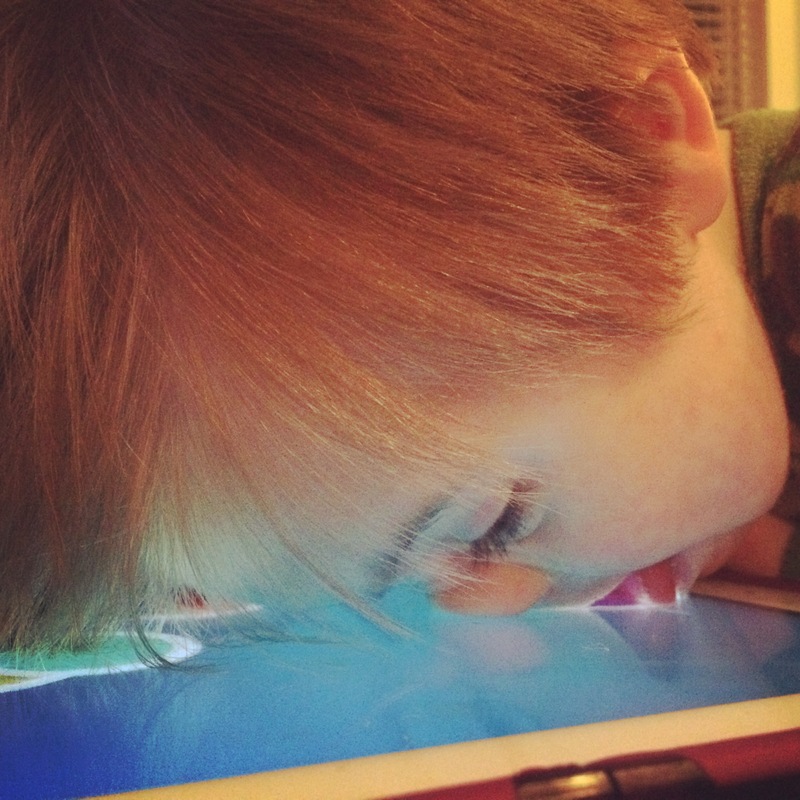 We would put the iPad on the ottoman and let him lean against the screen with his face down. We figured at least he was working his leg muscles and not hurting himself in any way. It is still a type of stimming for him, but it’s definitely the lesser of two evils. He also has a terrific relationship with our Ikea stools. I think it’s just because of the dot pattern on the top, but he will crawl over to them and giggle. He will pull up on them, laugh, sit down, repeat. Just this week he actually started picking the smaller one up in the air and inspecting it. Baby steps, but for a boy who didn’t willingly move on his own, it’s great to see this kind of progress. Honestly, it’s really hard to tell exactly how bonding is going. On one hand, he definitely responds much better to people in general. Little dude LOVES to be held, and would be content if someone held him all day. Considering that they told me at the orphanage that he didn’t like to be touched, I’d say we’ve come a long way. It breaks my heart a little bit to think of him not being touched for so long, and how he probably desperately wanted/needed that but had no way to communicate that to his caregivers. The longer you go without touch, the harder it is to accept at the beginning. You can tell in this picture with his Auntie Jessica that he doesn’t really “help” her hold him at all. That was after he had been with us for about a week. He was just kind of limp and would let you do all the work. 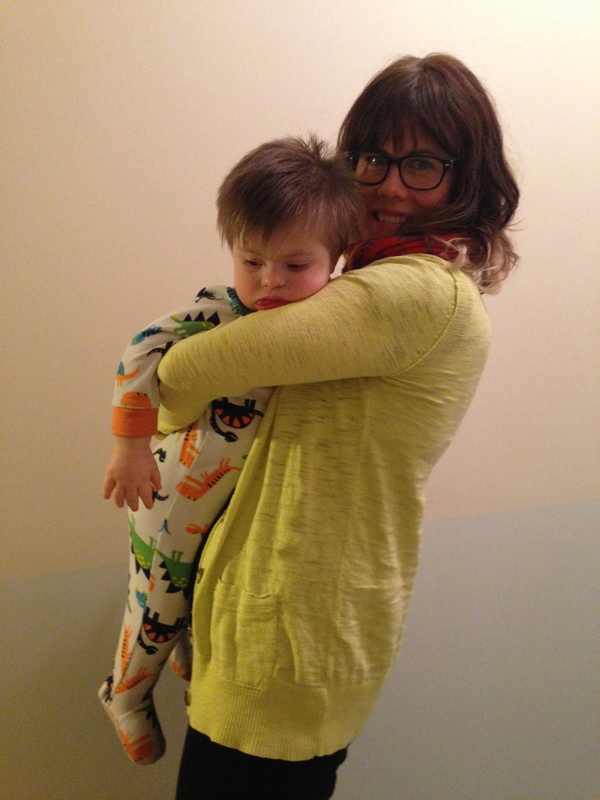 Now he snuggles in and tightens his arms and legs – clearly interested in making sure his holding session doesn’t end. Initial “holding” of Boo was so hard, because he was basically limp in your arms! The hard part is that he doesn’t necessarily care WHO holds him, so he’d be just as content with a stranger as he is with Daddy K and I. He definitely recognizes us, but I’m not sure he understands yet that we are his people. 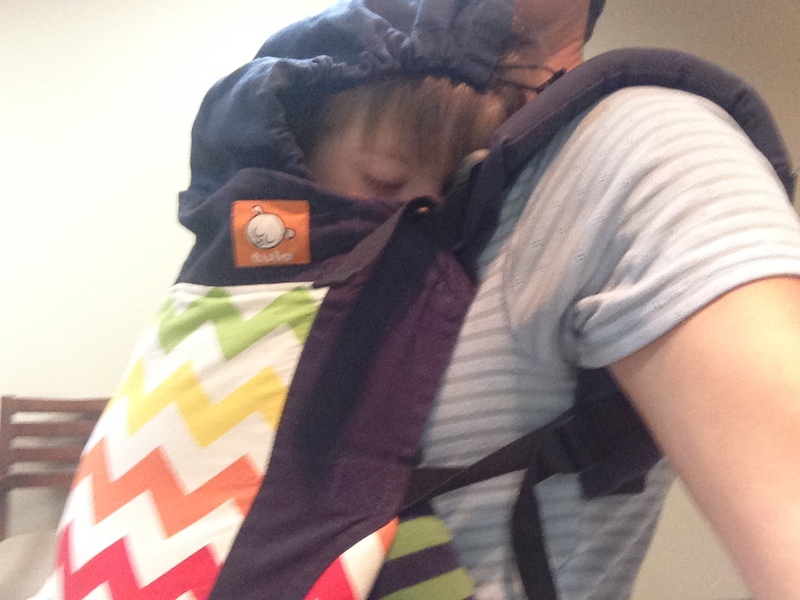 On a good note, he absolutely loves to be worn in the Tula. If I start to strap it around my waist, he will crawl over to me. When he is being worn, he constantly looks up and makes good eye contact, and he is content for long periods of time. He gets lots of practice in it as we traipse all over town to various appointments, not to mention to swimming and gymnastics for his siblings. But it’s a good sign (to me at least), that he enjoys being close to his mama. He definitely is a million times more alert and engaged three months in. I can remember that when we first met him, it seemed like his eyes were hardly open – he just wasn’t that interested in what was going on around him. Now he constantly makes eye contact and looks around and checks things out. His smiles comes super easily, and over the last few weeks we have noticed he has started to laugh at things that are funny, not only in response to physical touch. It doesn’t happen often, but it DOES happen, which is a big step forward. I’m not sure who this is, but she doesn’t seem to leave until I pay her a little attention. On the medical side, he is actually doing great. We got a clean bill of health from the cardiologist, who actually said his heart is pretty perfect! We never have to go back, so it’s nice to cross one major thing off the list. We also saw a pediatric ophthalmologist, and Boo’s main eye issue is a condition called nystagmus, which is essentially involuntary movement of the eyes. If you watch closely, you can see that his eyes sort of shake back and forth. He is also a tiny bit far-sighted, and between his low muscle-tone and nystagmus, the eye doctor wanted to see if glasses would help him. It’s hard to say for sure, but we feel like it has been good for him. Learning to wear my new glasses! Mama ordered a second pair, since my first pair is currently hiding! We JUST has his sedated ear cleaning/tube insertion/hearing test. If you feel like gagging, you can Google impacted ear wax removal and watch some gross videos to get an idea of what took place. Basically, his ear canals were both totally full of hard wax, and it took the ENT quite a bit of time to clear them. Once they were clean, she still noticed quite a bit of fluid in his ears, so she opted to place a couple tubes. The audiologists went to work after that, and we will get a full report on their findings in two weeks (at our follow-up). The ENT mentioned briefly that his right ear was almost completely normal, and it seemed like his left ear might have some conductive hearing loss. Although she mentioned she thought that still might be the after-effects of the massive fluid build-up in his ear. Still on the fence in the ear department, but honestly, we feel like he hears fairly well. They did take ear molds in case they need to build hearing aids for him later. He has been climbing the growth charts slowly and steadily. We had a little setback at the beginning where he dropped some pounds, but now he seems to be growing every day. He has gained 3-4 lbs and grown about an inch/inch and a half since coming home. He has started filling out, and honestly just is starting to seem much more like a little toddler than a baby. His body control is SO MUCH BETTER, especially his head. Technically, we should be having therapy for four hours each week. It was recommended that he have Occupational Therapy twice a week, for an hour each time, Physical Therapy once a week for an hour, and Speech Therapy once a week for an hour. For now, the Speech Therapy is mainly focused on feeding therapy, which is why it’s an hour once a week. Once we get feeding rolling, we will move to focusing on speech, which is more likely to be 30 minutes, twice a week. In reality, our PT is really good, so that means it’s hard to get in her schedule. So we have only had a couple of PT sessions. And I just can’t make OT twice a week right now, so we only go once. So basically, we see OT and Speech each week right now. Trust me, it’s enough. 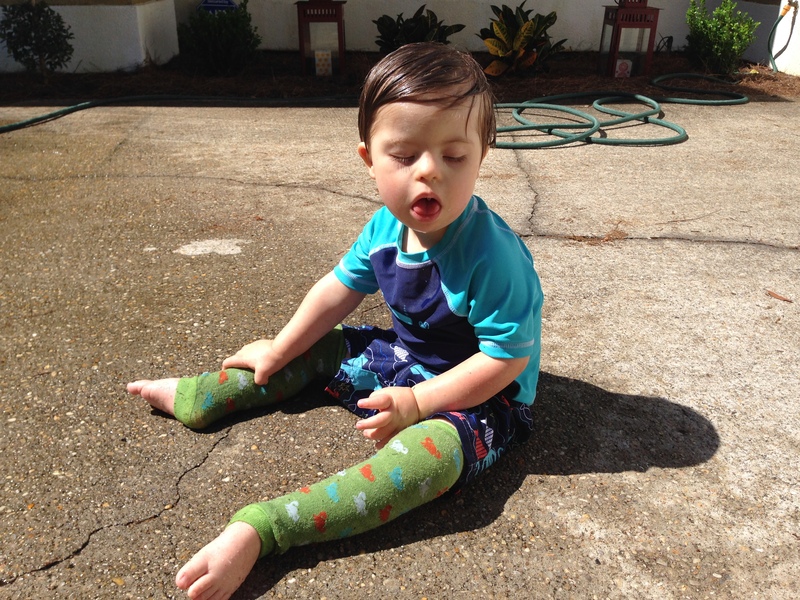 🙂 One of his biggest issues that we focus on in OT is his sensory processing, specifically his proprioceptive and vestibular issues. 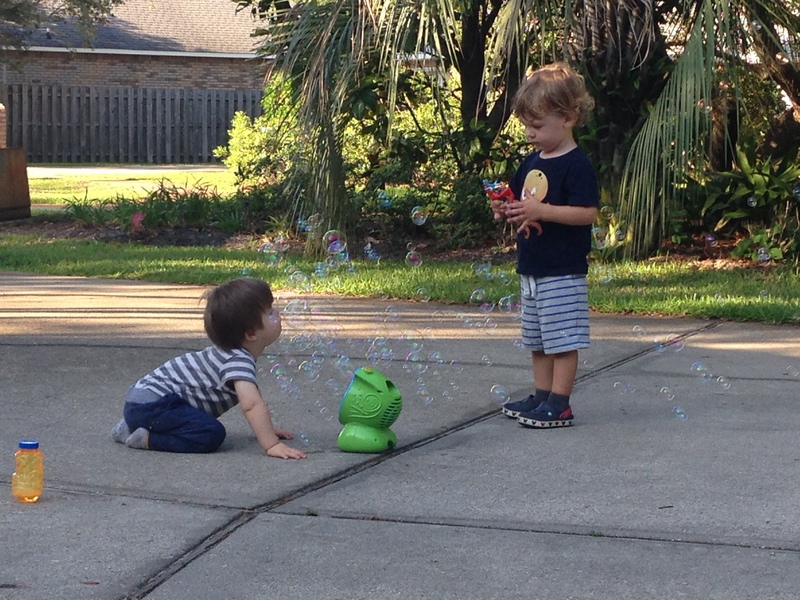 The proprioceptive sense basically tells you where your body is in space, and little man has a super hard time with this. It’s most likely a combination of his extremely low muscle tone and the lack of much movement in his early life. A sort of vicious cycle really. But it’s been good to see how he reacts in a different setting and with a different “coach.” The more familiar he becomes with his rooms and the specific tasks she usually does, the better he responds. For PT, she wants to work on strengthening his core and trying to re-teach him how to align his spine. He kinds of slumps over when sitting and hangs his head even when standing. So we are working on getting him to hold his head up and trying to develop his little baby core. He’s come a long way, and will crawl around the house much more now to explore, pick up certain things he comes across, and pull up onto many of his favorite chairs. I like to walk if you’re holding my hands! 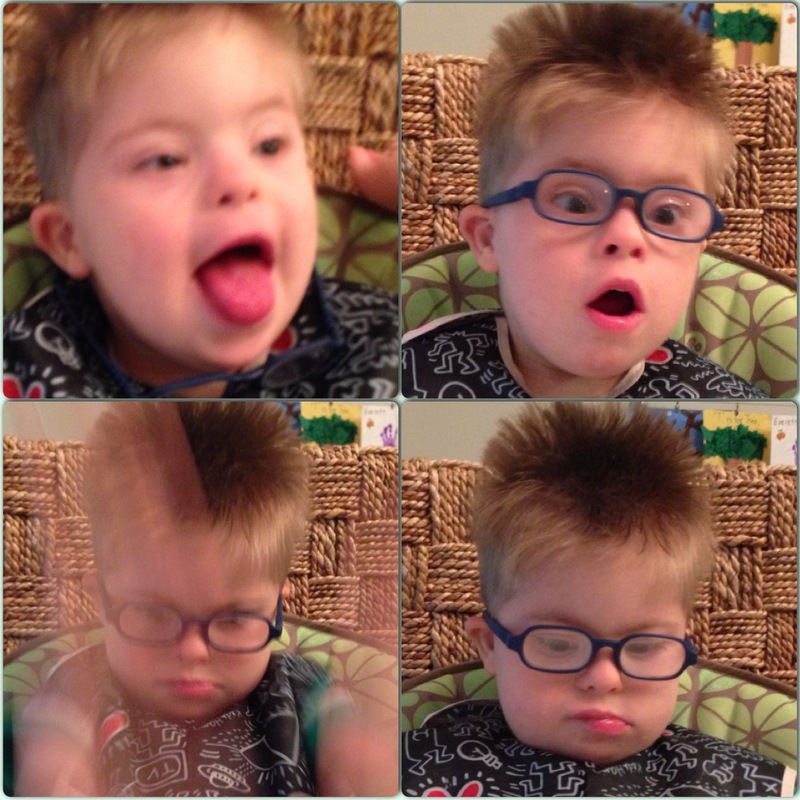 In speech therapy, we have basically just been doing a lot of different things to try and engage his teeth. He craves oral input, but just does not want to use his teeth for eating. We think it was mostly a survival issue – he was fed large portions of food in VERY short periods of time, and he basically learned to do a hard swallow to get everything down in time before the next bite came. 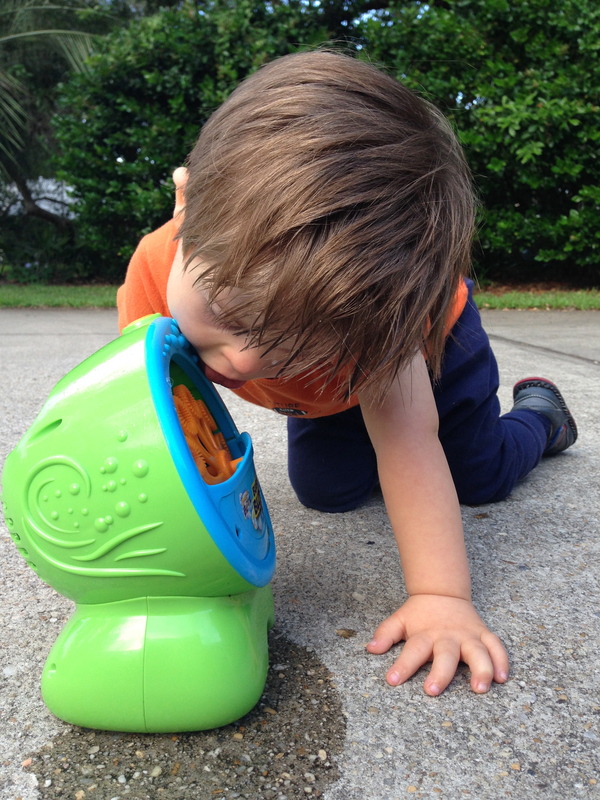 We are trying to teach him that food can be fun and that it’s okay if it moves around to all parts of his mouth. His therapist has also been working on lip and tongue exercises with him to help him with his tongue thrust. This is important for both eating and speech. My speech therpaist says my faces are partly because I’m working so hard to get food down. Eating is all business for me! 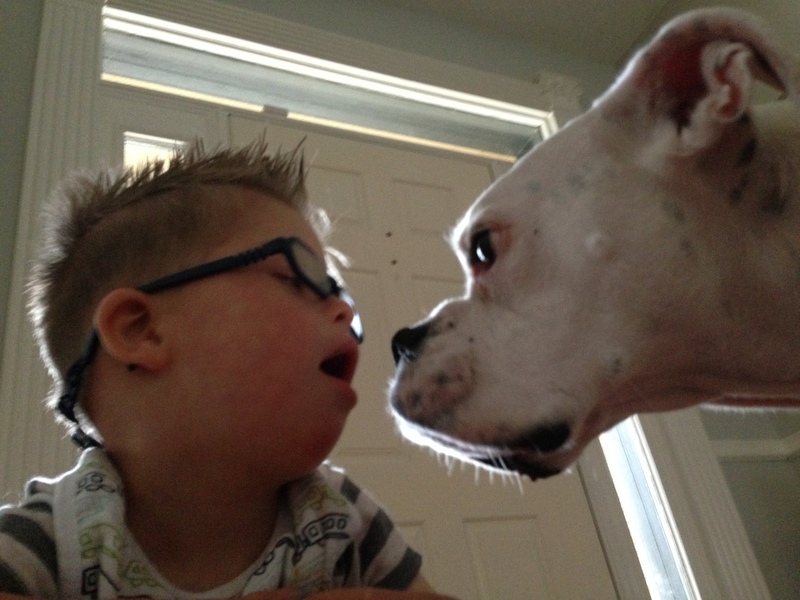 The boys love to play together, and Boo will often try to wrestle Bug! Sissy mostly seems ambivalent about it all. I think to her, he’s just another brother. She loves to try and help take care of him, but she makes him a little nervous so he tends to cry when she does something with him. I think she doesn’t understand why he doesn’t want to play with her, so she gets sad. But she is really perceptive, and she’ll watch him and actually notice if he likes something. She understands that he doesn’t enjoy a lot of things yet and she will tell me, “Look, he is laughing!” We were also having a talk with her one night about how you can’t use certain words to describe people because they aren’t nice. She genuinely just didn’t get what we were saying or understand why people would care, and I said, “Well, what if someone made fun of Boo? If they just kept saying mean things about him over and over? How would you feel?” She looked at me like I was the un-smartest person she has even met and asked, “Mom, why would anyone make fun of Boo?” Duh. So, since our one month home post was all about my heart in this, I figured I’d give a brief update here as well. I recently read a quote from Dr. Karyn Purvis, one of the leading researchers in regards to interventions/response for at-risk children, sometimes referred to as children from “hard” places. She said, “It is not you against this child. It is you and this child against this child’s history.” I have a multitude of her (and colleagues) work – books and videos – but it’s not super easy to find the time to work through it. But that reminder was so good for me. 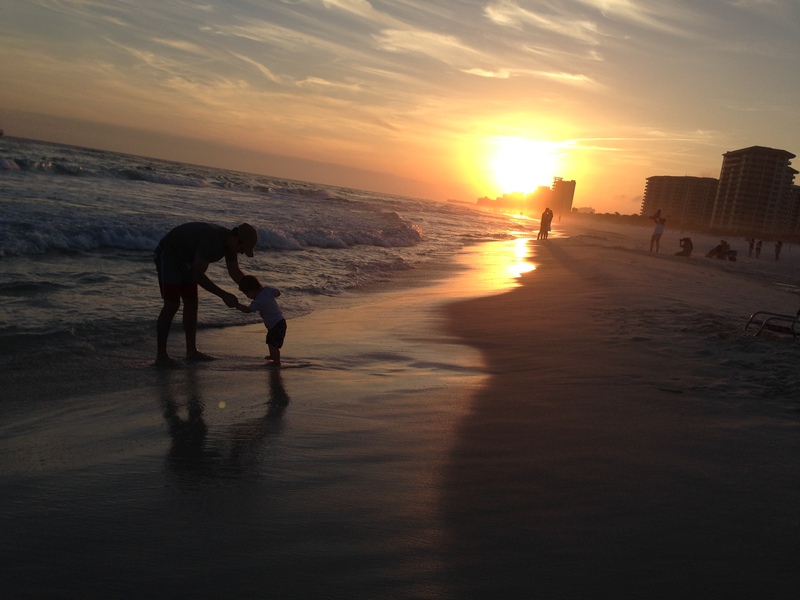 Because this is seriously hard work – this mothering a child from a hard place. Unfortunately, it’s really easy to get super frustrated at the difficulty of it all. And when I get frustrated, I tend to feel combative. For some reason, I’m ready for a fight. And naturally I mistakenly start to believe that my fight is with this child – because he is the person right in front of me. And if you know me, you know I like to win. Basically, I’m saying I can be a real jerk. So it’s been (still is) a process of learning to let things go, accepting that I can’t control his behaviors, nor how fast he heals from past hurts. Shockingly, it’s not about me! 🙂 There IS a battle going on, but I’m in it WITH him, not against him. But, it’s just hard not to be able to immediately make things better. 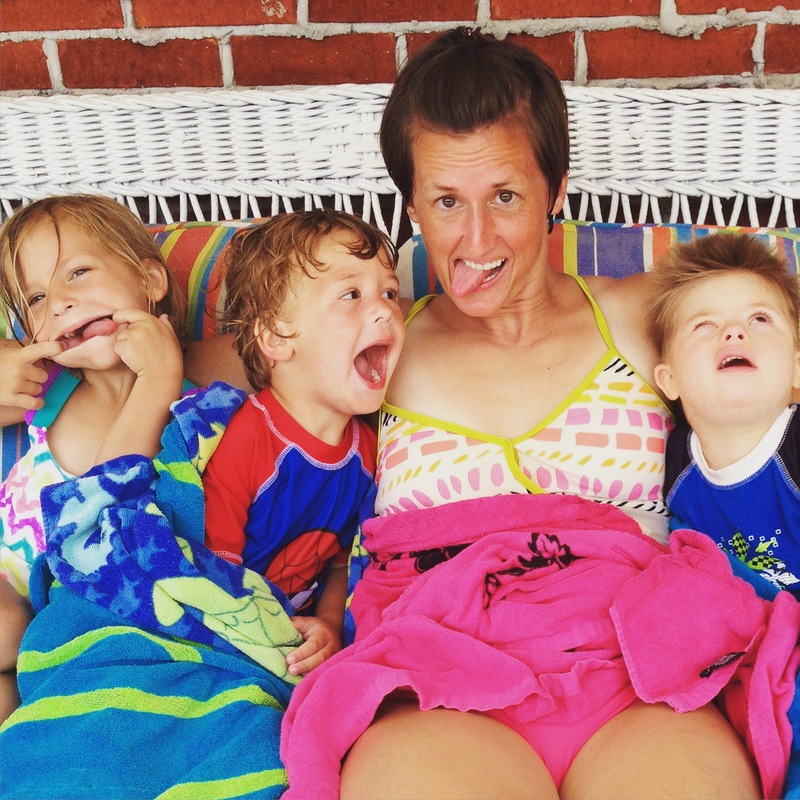 I also read an article recently about all of the feel-good stories about kids with disabilities (and specifically Down Syndrome). Not that all of those stories aren’t awesome, because they are – I love them. But this article talked about the message that might send to families whose children will never reach that same level of success – because disability is a spectrum. And it kind of cautioned that we might be unintentionally ascribing worth to our children based on how close to “normal” they become. And I think there is some truth to that. But a person’s life, a person’s value – it’s not dependent on whether or not they fit nicely into society. They have worth and value simply because they are alive. And I think I subconsciously was hoping Boo would start acting “normal” pretty quickly – and when he continues to exhibit hard behaviors (self-harming, whining, learned helplessness, etc), I have a hard time reconciling the reality of where we are with what I had hoped for. Daddy K and I laughed the other day over the fact that we actually can’t wait until his Down Syndrome is the only thing we have to worry about. But it’s a good lesson on what it really means to CHOOSE love. On what it means to be family. Boo didn’t ask for or deserve any of the trauma life has given him. What he needs now is for us to be patient, to be gentle, to be kind. Even when we don’t feel like it. Maybe especially when we don’t feel like it. We already don’t recognize the little boy we see in the pictures from his orphanage. 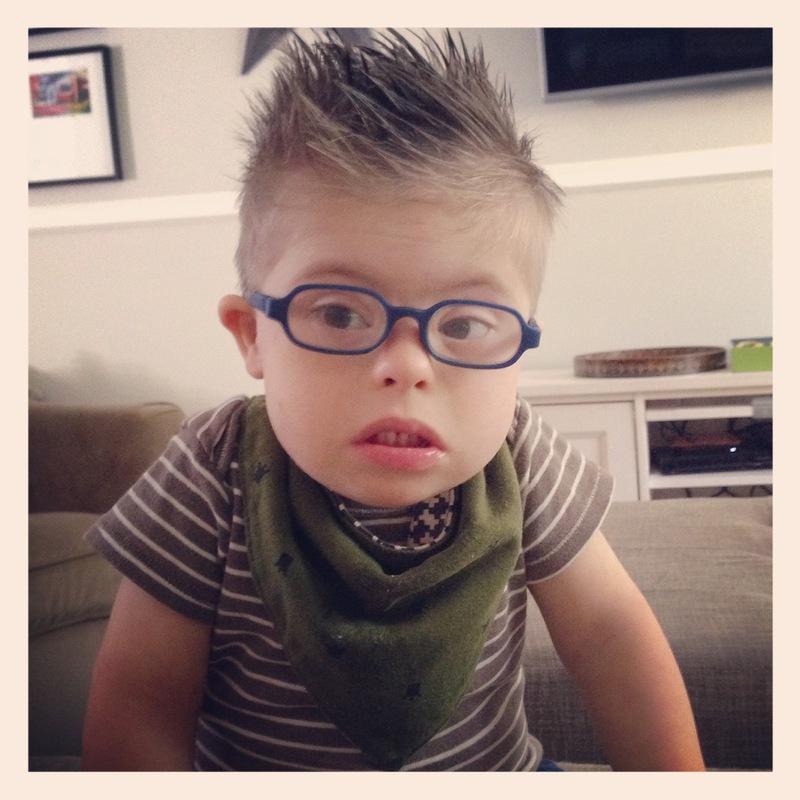 I’m excited about the possibilities for the little boy we will meet in the coming months.